Sasha is Chief Proof-reader for Anne's Guide Dogs resources! 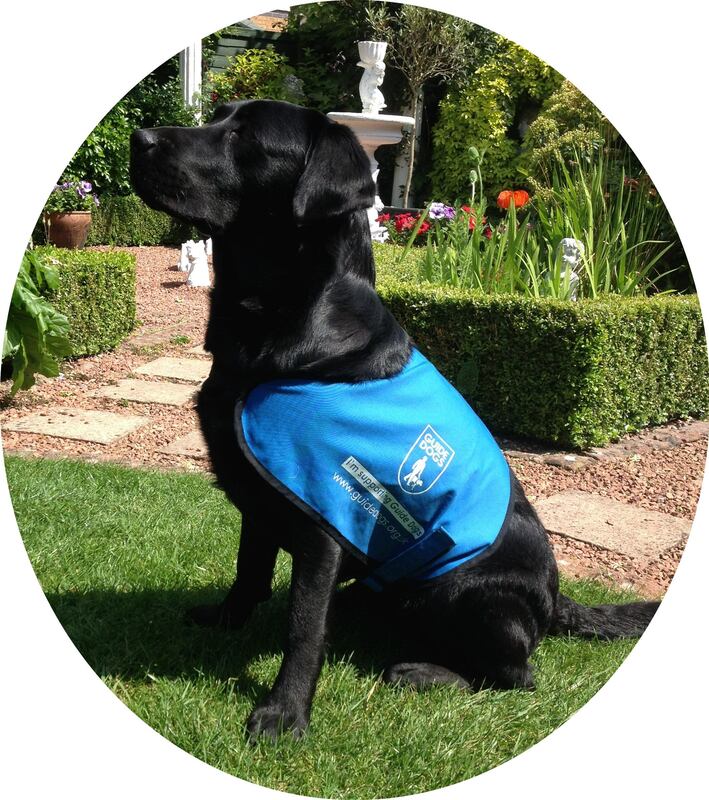 YOU ARE WELCOME TO DOWNLOAD AND USE THESE RESOURCES FOR THE BENEFIT OF THE GUIDE DOGS CHARITY. CLICK HERE FOR AN OPEN LETTER FROM A GUIDE DOG OWNER TO HER GUIDE DOG - IT SHOWS YOU EXACTLY WHAT GUIDE DOGS IS ALL ABOUT! Here is a simplified version suitable for reading with children's groups. If you do use anything, please send me feedback so I know whether it is worthwhile for me to keep adding to the bank of resources. "Pat & Chat" bunting can be downloaded here. It consists of 9 pages to print and cut out. There is a page of instructions and then three flags per page, spelling out "Pat & Chat" and with photos of 16 different dogs. If you laminate the flags it is important to round off the edges so that you don't get sharp points! The flags can be hole-punched and threaded with ribbon or string. Half-sized flags are still big enough (just!) for a normal hole-punch. "My Guide" bunting can be downloaded here. I have not included all the pictures of dogs with this set, so you will need to print those from the first set if you want more flags. All dogs featuring on the flags are from the Malvern/Ledbury/Worcester area. In the photo above the first set of bunting is hanging in three loops from the Worcester Warriors' gazebo at the Royal Three Counties Show in Malvern. They hosted the Guide Dogs display as part of their "Lead the Way" campaign. These sheets can be used to raise money/awareness - the puzzles use Braille like a secret code, with the Braille alphabet written out at the top of each one. For example, a cafe which has a Guide Dogs collecting tin might like to have the Cafe wordsearch available for their customers to try while relaxing with a drink, and the Fete or Carnival one is suitable for any such event. It is Braille for sighted people, not real Braille - I am investigating the possibility of getting some of the puzzles Brailled properly. Word Search about Guide Dogs with Key. Guide Dogs Word Search personalised for Sainsbury's. CLICK HERE FOR AN A4 SIZE POSTER TO ADVERTISE ANY OF THE ABOVE WORD SEARCHES. Youth Group quiz - can be given out the meeting before a talk on Guide Dogs, as homework. VETS Puzzle - if your Vets have a Guide Dogs collecting box in the waiting room they might make copies of this puzzle to display next to it. I can add your Vets' own logo if you would like a personalised version. N.B. For a Braille Trail you need to make some bright 'starburst' signs and put a Braille letter on each one - use stick-on gems so the dots are raised. These need to be placed around the hall in each identified place, and the letters need to spell the names of dogs on the poster. 'Just for Pets' petshops Braille Trail and poster. This is based on a sheet in the Guide Dogs Schools' Pack, but I have adapted it to include the Braille Alphabet and I suggest using stick-on gems to create the raised dots. Write your own messages in Braille. This two-page document provides a blank template for children to write 'secret' messages to each other in Braille. I suggest printing the two pages half-size on one sheet of A4 - it is all too big otherwise. The Guide Dogs Schools' Pack has a template for making a Guide Dog mask. I got packs of card, crayons and coloured lolly sticks to tape onto the back (all from 'Poundland') so that children can design their own mask. 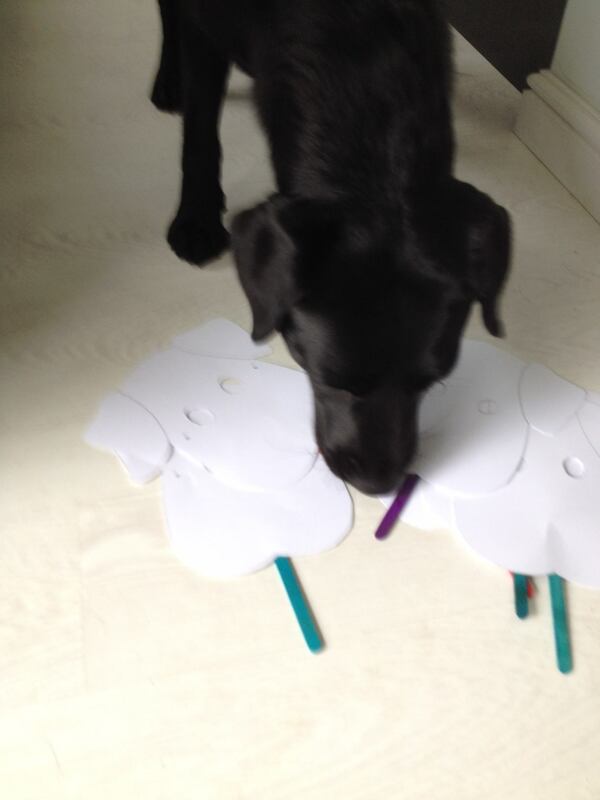 It takes ages to trace round, cut them out and get the sticks on, but children do enjoy it! Sasha is always very proud to wear her volunteer uniform. If you would like me to create something specifically for you, do get in touch by email.